Love London? Go for a ride. Leaving work yesterday, the sun tapped on my back as I crossed the Old Kent Rd and reminded me what our city streets are really for on a warm, sunny evening after work. So I turned the wheels round and headed riverwards. I turned off the four lane whizzalong of the Old and New Kent Roads and headed down through Burgess Park, through Trinity Square where there was some kind of shoot going on, (photo, not the other kind some people are a bit too quick to associate with south-east London streets), got slightly confused by the cycling detour which rules out the bike friendly Upper Ground route while they hack about Sea Containers House, and finally turned on to the river. Lots of bikes had beaten me to it. Considering what a popular place this is, there is very little bike parking. But I quite like the way the railings are decorated with an assortment of bikery. I think it adds a friendly warmth to our cityscape. 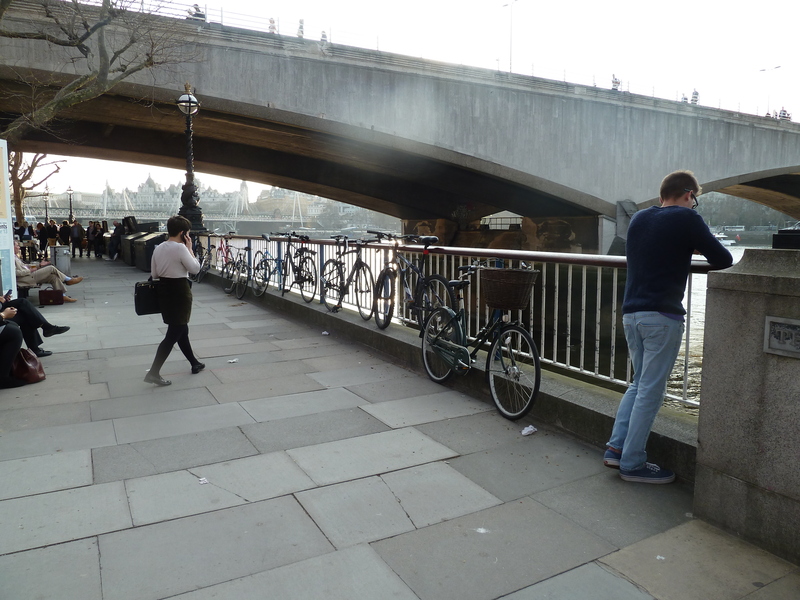 I know some of the corporate landowners who have grabbed some of our riverside spaces in recent years disagree (yes, I’m thinking of you, More London) but I have no idea why they object so strongly to something so aesthetically pleasing as a bicycle attached to their street furniture. 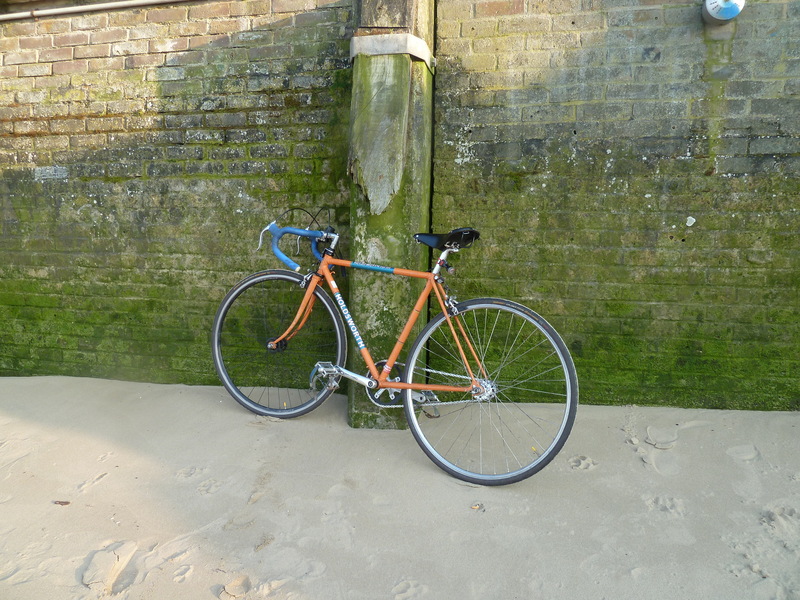 Tried to ride on the sand, but either it’s the wrong kind of sand, or 23’s are not really the best choice for beach cruising. Finally found a parking space, meter free with a good riverside view. After an hour or so, I headed home in the fading sun. The evening reminded me of a great tradition, begun many years ago by the sadly missed Barry Mason. Most Thursdays he would be at the Southwark Needle at 6.30pm waiting to lead whoever might turn up for an evening spin along our city streets. 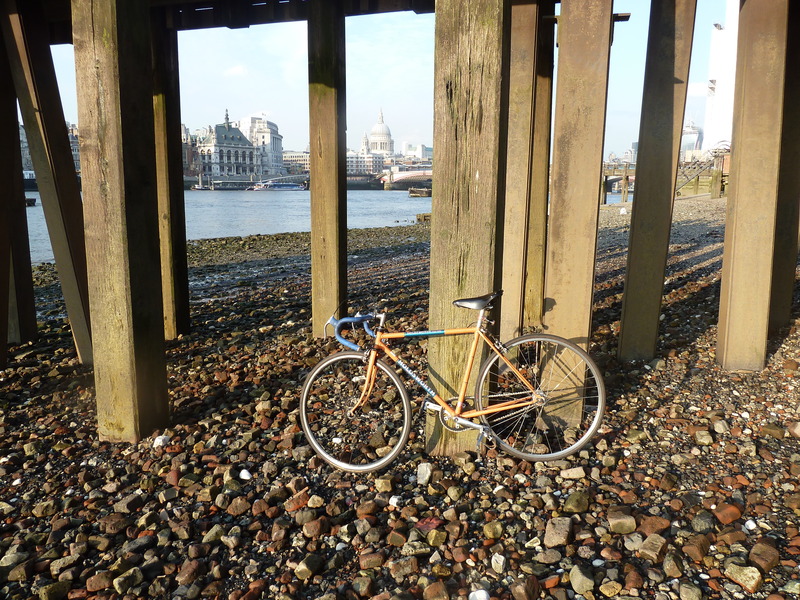 Often, these rides were riverside based, exploring the diversity of the Thames. So I think, partly as a tribute to Barry, I plan to revive this great tradition. 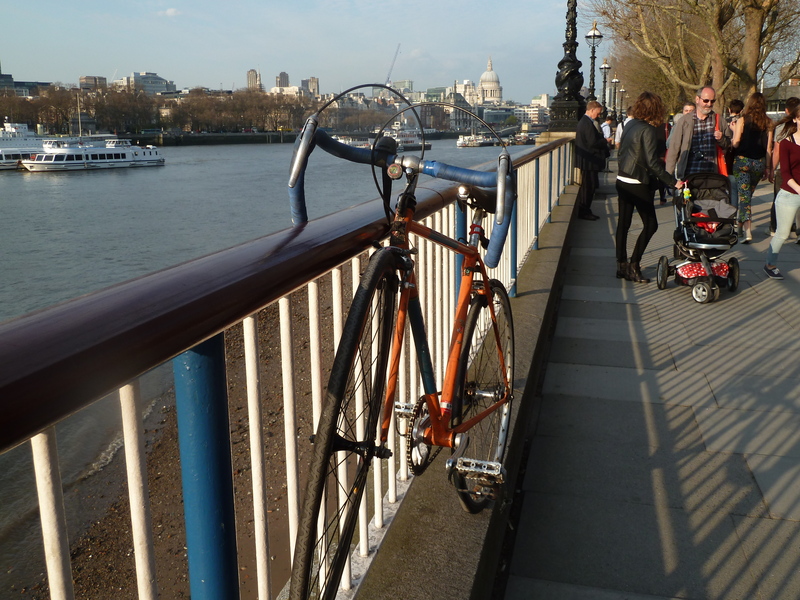 I’ll be at Southwark needle next Thursday, 2nd May, 6.30 pm ready to ride for a couple of hours or so, and if anyone wants to join me, they are most welcome. It’ll be a relaxed kind of ride for sharing conversation about the things we see, and will probably end in a pub where we can drink a toast to Barry. Ooh, I think I’ve seen you and your bike. During the cold weather earlier this year, you were riding with a few others along Giffen Street, SE8, and peeled off to go through Crossfields. You? In any case, a very good looking bike there! Yep, may well have been me leading what was left of a Lewisham Cyclists ride that had gone up to Islington, then along the canal to Paddington and back through the city. Gosh, if I was still in London, I’d be there in a heartbeat. Barry’s Afterworkers were such a joy. So glad you’re reviving the tradition. Maybe you’ll visit sometime and join us. I am retiring from teaching this year so feel more able to commit myself to this kind of thing. I also hope to be able to start going on the FNR’s again. I found night rides left me a bit wiped for at least 3 days once I hit 50. And a knackered teacher on a Monday is not good for pupils or colleagues. Which is why you haven’t seen me on them for quite a while. Congratulations on your retirement – you look far too young! It’d be great to see you on a FNR. Meanwhile Adam’s got a few rides planned if you’re interested. They’re on CycleChat – “Tilting at Windmill” and “Dun Run Lite”.